The autumn property shows have just ended and Russian investors are starting to get used to the bitterly cold winter months ahead. Some lucky folk will be jetting off to their villas and condos in the sun, while their friends enviously sit at home watching the snow fall. However this is the perfect time to promote your properties! 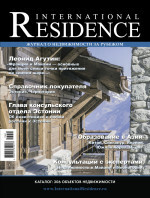 The internet is taking over big time in Russia so it is becoming the source for buying real estate especially abroad. In this month's newsletter we cover what's happening around the European markets, with Visas the latest way to grab buyers. Plus we tell you where are the top hotspots attracting Russians and read about how you can get on board the internet sales boom. Is It Boom or Bust for Israel's Property Markets?